The cardboard of the inner box will be of a thicker stock than previously released expansions. Reprints of these will also use this new, thicker stock. While there won't be any summary cards in this expansion, we will release a full, updated summary deck covering both the core game and all its expansions, later this year. This deck will be available free of charge at all conventions we attend, and for a simple shipping and handling charge from our web site. Richard Borg has really outdone himself again with this new expansion! Come back soon for more information, as we will be posting the rules shortly. I would highly recommend this expansion for those who like the original but would like to see more variety in the troops - the Japanese require a very different style of playing than previous sides. 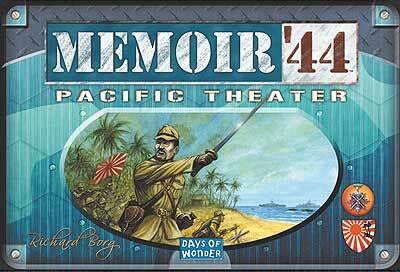 This is yet another expansion to Memoir '44. Like the other large expansion, this one provides new miniatures, new tiles, new rules and new scenarios. It works beautifully together with the Air Pack expansion, and I highly recommend getting both. Perhaps the only expansion for M44 that only needs a base set to really shine! Also, if you have any interest in the Japanese front, this is definitely the route to go.